As Salesforce pushes out updates for the Salesforce for Outlook extension, users will individually need to run the update to get to the latest version. I hope the following steps will make it easier for you to complete the update yourself! If it is still running , this is probably hidden in your System Tray / Notification Area. *The icon will be grey or red. *With both Outlook and the Salesforce for Outlook app closed, you can now run the update. Go to My Settings to find and download the latest version for Salesforce for Outlook. On the My Settings landing page, you should see the Desktop Add-Ons on the home page. 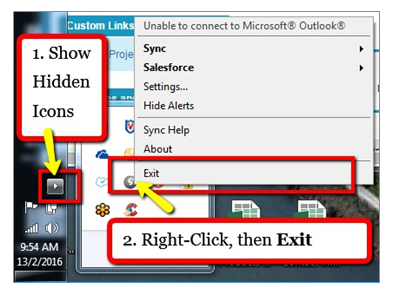 You can also type “Outlook” into the Quick Find box on the left. Double-check that Outlook and the Salesforce for Outlook app are closed, then run the installer. If you continue to have issues, please contact your Help Desk or Salesforce Administrator. If the upgrade didn’t run, try rebooting the computer, check and ensure the Salesforce for Outlookapp is closed, and run the installer. These instructions assume the logged-in user has local admin rights on their PC. If not, please contact your IT Help Department. It may be necessary to purge the local database file. 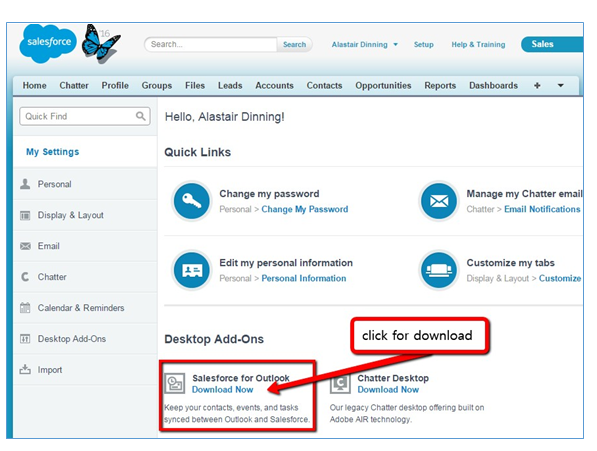 Start | type %appdata% into the Search box | folder: Salesforce.com | folder: Salesforce forOutlook | find and delete the folder DB.